Episode Review: CHUCK: "Chuck vs. The Family Volkoff"
With Chuck being off the air for the past couple of weeks, I was hoping that when it made its return that we'd be getting one of the better episodes of the season. Unfortunately, "Chuck vs. The Family Volkoff" was a mixed bag thanks to said family. 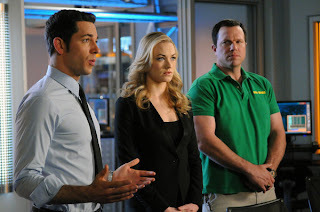 The main plotline revolved around Team Bartowski dealing with Alexi and Vivian Volkoff. After Castle was blown up real good by bombs that were made with Volkoff parts, the C.I.A. decided to put a kill order on Vivian, but of course Chuck looked for the good in her and convinced Beckman to let him meet with her so he could convince her to turn herself into the government. The General only agreed to the idea if Casey led a sniper team just in case things took an evil turn. At the meeting, Vivian claimed she wasn't responsible for the bombing and even brought a weapon as a peace offering, but of course things didn't end up going as planned because someone took a shot at her which scared her off. In order to figure out what the weapon's function and to save Vivian, Chuck suggested they use Alexi to help them out. It was determined that the weapon, the Norseman, was missing its targeting component and so dangerous that Alexi was let out of prison to help the team find the missing part. After some globe trotting, a showdown with a Somali pirate, and the most predictable twist ever, we found out that Vivian was indeed a baddie and was using Chuck and her father to get her hands on the Norseman. Honestly, I was not a big fan of the main story because it just felt lazy. Making Vivian the new Big Bad was so predictable, that I actually thought the writers were going to try something different, but they ended up taking the easy route. There's still a chance that they'll redeem Vivian, but at this point I no longer care because they turned a potentially interesting character into a worn-out trope. Luckily, Timothy Dalton was able to give us so more devilishly great moments to redeem the family name. The tacked on sub-plot about Sarah's prenup also felt uninspired and didn't really add anything to the episode or to their relationship. The B-plot was also a bit lackluster because it relied too much on drawn out tension that wasn't all that interesting to begin with. Ellie's still working on Orion's computer, and Mary made it her mission to get in her way. After Mama B deleted some files on Agent X, Ellie became suspicious and decided to do her own spy work so she could catch her mom in the act, and of course Awesome just stood around and pretended like he didn't know what was going on. I haven't hid my feelings about how much I dislike the whole "Ellie's brought into the spy world" arc that this season's been telling, and "Family Volkoff" didn't change my mind. It's still a silly idea, it doesn't highlight the strengths of Ellie or Awesome, and it's built on the same delayed miscommunication cliche that made all of the Chuck/Sarah will they-won't they stuff boring. After a few episodes, I still do not understand why Ellie is obsessed with the Intersect project, what she's supposed to add to the overall story, or why she's Agent X, and I don't care at this point. The only bright spot of the episode had to do with the Season MVPs; Morgan, Casey, and Alex. Ever since rooming together, Morgan and Casey, have become the oddest (but the best) fake married couple on TV, and their synchronized breakfast routine was one of the few laughs of the night. It was also nice seeing the strengthening bond between Casey and Alex, and I'm interested to see how his ex will be incorporated into the show. We're already getting Game of Thrones references? Life or Death Uno might be the best thing this show has come up with. Hot Mama & Six-Pack are great spy handles. It's just too bad they're not a part of a more interesting story. I can't believe I'm saying this, but I'm ready for Chuck to come to a close. It's still one of my favorite shows, but Season 4 has been so uneven that I cannot imagine having to endure another go round. Now, if it can get back on track during these last four episodes, then I may jump back on the bandwagon. Until then, I'm totally OK with Chuck bowing out gracefully. Episode Review: JUSTIFIED, "The Toll"